Batman is out of town. Barbara Gordon knows this when she asks her father what he thinks life is like for the Batman. As the Commissioner leaves for work, Barbara pulls out her Batgirl costume for a party. When she arrives, she goes looking for her friend Sandy. She encounters a grumpy security guard who shoos her away. Moments later the security guard is attacked by Harley Quinn. Batgirl joins the fray, soon followed by Poison Ivy. Harley and Ivy are trying to kidnap Sandy. Batgirl tries to free Sandy, but in a moment all four ladies are knocked out by more security guards. When Batgirl wakes up, she and the other gals are now prisoners of Catwoman, who is trying to break into the floor above to steal a valuable gem. (The fake guards are in her employ.) Catwoman makes off when the gem. Batgirl convinces Ivy to use her wrist arrows to free her, and Batgirl pursues Catwoman. Batgirl retrieves the gem by bluffing Catwoman. Yeah, this is not the best issue. But it’s not the worst, either. The plot is one of those efforts to cram in as many characters as possible, and the end result shows it. 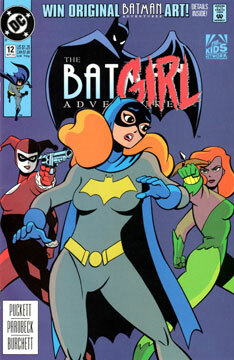 It’s worth noting that this issue represents the very first time Harley Quinn appeared in a comic book. This may be one of the few times I criticize Parobeck. As usual, most of his work here is excellent. Barbara/Batgirl, the Commissioner, and even Catwoman are drawn reasonably accurate. The background characters are full of life. But Harley and Ivy… What happened? Both were drawn off model, with a slightly more realistic feel to their faces. It doesn’t help that they were colored wrong. Ivy seems to have spent far too long tanning, and Harley’s red mask just threw everything off. Being the Harley (and Parobeck) fan that I am, I hate to see her debut so botched. This could work well after “Shadow of the Bat,” except that the dialogue between Batgirl and Catwoman doesn’t fit with what follows in “Batgirl Returns.” Because of that this one’s hard to fit in. “The man behind the Rockridge heist” is the only thing new that appears (for one panel), unless you want a miscolored Harley and Ivy.